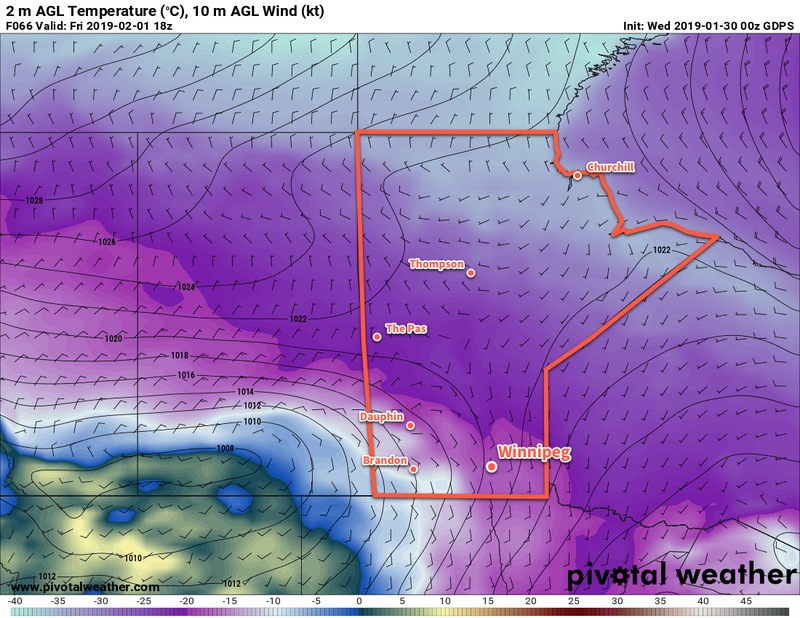 Winnipeg will slowly emerge from the bitter cold with a climb back towards seasonal temperatures. Winnipeg will see yet another day in the deep freeze today. With the Arctic high still working its way across the province, the temperature will struggle to a high near -30°C in the city today. Fortunately, winds will remain light through the day, making the cold slightly more tolerable. Temperatures will dip to a low near -36°C tonight before some cloud cover begins building into the region. Thursday will bring milder temperatures as Winnipeg climbs to a high near -25°C. Winds will be out of the southeast in the 20 to 30 km/h range, producing wind chills in the -35 to -40 range. The city will see a slight chance of flurries with little to no accumulation. Temperatures will slowly increase overnight to around -23°C by Friday morning. Markedly warmer temepratures will spread across the southern Prairies on Friday. A series of disturbances will track across the province on Friday. These systems will bring plenty of cloud alongside near-seasonal temperatures to the region with highs near -11°C. The first is forecast to pass through on Friday morning, followed by the second one on Friday night into Saturday morning. These systems will bring a swath of 5 to 10 cm of snow western Manitoba and the Interlake, but here in Winnipeg there will just be a chance for a bit of light snow. Winds will once again be out of the south at 20 to 30 kn/h for much of the day. Skies will remain cloudy on Friday night as temperatures dip to a low near -13°C. Temperatures should remain for much of the weekend with highs near -10°C and overnight lows in the minus teens. A major pattern change is possible on Sunday as a long-wave trough moves into the region. Current forecasts indicate the development of a Colorado Low that would lift northeastwards into Minnesota on Sunday night, spreading a large area of snow across the region late Sunday into Monday, followed by breezy northerly winds and falling temperatures. Early indications are that this system could produce as much as 15 to 20 cm of snow. This leaves the city with a the chance that we may be starting off the next work week with the aftermath of a notable snow storm! Winnipeg’s seasonal daytime high is currently -11°C while the seasonal overnight low is -22°C.